One of the most popular starting points for building microcontroller-based projects is the Arduino Uno, the board based on the popular Atmel ATmega328 and supported by the free Arduino development environment. Despite its diminuitive size it's packed with capabilities, and apart from having fewer I/O pins it can do most of what the ATmega328 in the Arduino Uno can do. And you can program it from the same Arduino IDE used with the Arduino Uno. The heart of this kit is the Tiny AVR Programmer from SparkFun, a programmer board that fits directly into a computer's USB port, and allows you to program an ATtiny85 in the on-board socket, or in an external circuit using jumper leads. 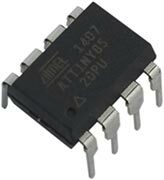 It can also be used to program other AVR chips, such as the ATtiny84 and ATmega328. It's available from SparkFun , or from Proto-PIC in the UK . A set of jumper probes to connect between the Tiny AVR Programmer and your own circuits . A mini breadboard, to build circuits without the need for soldering. I use the ones shown above from SparkFun  or HobbyTronics in the UK . A set of precut jumper wires. I particularly recommend the Pololu ones  as they are coded with the resistor colour code so you immediately know which wire to pick. They're available from HobbyTronics in the UK . A spare ATtiny85 (one is already included with the Tiny AVR Programmer). A few additional components for making projects: an LED, a push button, a piezo buzzer, a 220Ω resistor to use with the LED, A CR2032 3V lithium battery, and a breadboard-compatible battery holder (available from SparkFun  or Proto-PIC in the UK ). The total cost of all these components is about £25 or $40. By default the Arduino IDE now supports all the boards released by Arduino, but not the ATtiny processors, so next you need to add support for the ATtiny85. Although there are one or two alternative cores for the ATtiny processors, by far and away the best of these is Spence Konde's ATTinyCore. This not only supports the ATtiny85 in all of its configurations, but also most of the other ATtiny processors you might want to use in your projects. Once you have done this you should see a new ATTinyCore section on the Board option on the Tools menu, containing an entry for each ATtiny family. For more information about using the SparkFun Tiny AVR programmer see their tutorial, although this refers to using David A. Mellis's older ATtiny core which I no longer recommend: . The first step is to upload a program to the ATtiny85 on the Tiny AVR Programmer board. Specify that you're using the Tiny AVR Programmer by choosing USBtinyISP from the Programmer submenu on the Tools menu. Put an ATtiny85 in the IC socket on the Tiny AVR Programmer board, making sure it's oriented correctly, and plug the Tiny AVR Programmer board into a USB port on your computer. Open the Blink example from File -> Examples -> 01.Basics. If all is well the LED connected to I/O line 0 on the Tiny AVR Programmer board should blink once every two seconds. Remove the ATtiny85 from the Tiny AVR Programmer. Now connect the Tiny AVR Programmer to the ATtiny85 on your breadboard, using the jumper leads. Connect them from the sockets on each side of the IC socket on the Tiny AVR Programmer to the corresponding pin of the ATtiny85 on the breadboard. The circuit on the breadboard will be powered via the 5V from the USB port. 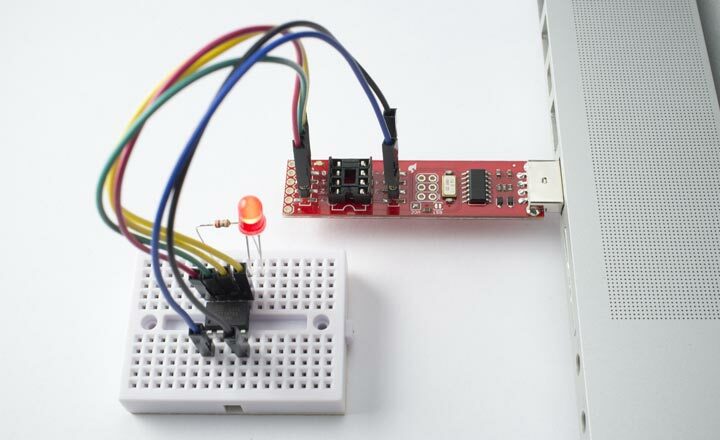 You can then download the program to the ATtiny85 on the breadboard and the LED should flash. The third step is to disconnect the Tiny AVR Programmer, and add a battery holder and battery. You now have a stand-alone version of your simple Blink application! If you want to change the program simply remove the battery, plug the jumper leads back in, and upload a new program. An egg timer - beep the speaker after five minutes (or ten if you like yours hard-boiled). A reaction timer - beep the speaker after a random delay, then see how long until the player presses the button. Light the LED if they achieve better than 160ms (the mean for college students). A musical doorbell; play a tune through the piezo speaker when the button is pressed. A bath level alarm - use wires connected to an analogue input to detect the water level and beep the speaker when the desired level is reached. A clock that beeps the time in morse code when you press the button - you'll need to calibrate the ATtiny's internal clock for accurate time. 27th February 2019: I've updated the above steps to describe Spence Konde's ATTinyCore, which is now my recommended core for using the ATtiny85 from the Arduino IDE. ^ Jumper Wires Premium on Proto-PIC. ^ 140-Piece Wire Kit on Pololu. ^ 140 Piece Jumper Wire Kit on HobbyTronics. ^ Coin Cell Battery Holder - 20mm on SparkFun. ^ Coin cell holder - 20mm on Proto-PIC.